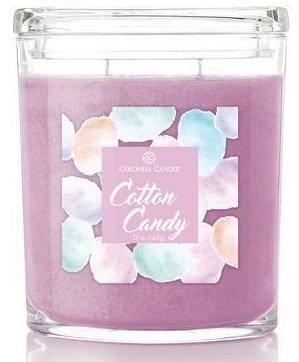 Cotton Candy - Colonial Candle - Candle Find ... the site for candle lovers! I’ve always been a sucker for a sweet cotton candy scent so when I saw this one on Colonial’s website – and on sale I might add… I purchased one to review. When I received it and smelled the wax… wowza! This candle smelled unlike any cotton candy scent I’ve ever smelled. Colonial’s version smelled like Aqualina’s pink sugar. It smelled like a musky and sweet perfume. Would the cotton candy shine through once burning? Oh, I hope so. Musk! That is most definitely what I smelled the most. Hoping the vanilla and cotton candy comes through once the candle is lit. Broken record here but… should you ever burn an oval jar from Colonial, do not trim the wicks prior to the first lighting. If you do, your candle will not burn correctly. The wicks right themselves on their own. I learned that the hard way after ruining several candles. Case in point – this specific candle had 2 inch wicks. Had this been any other brand, I would have trimmed both down to 1/4th of an inch but, I left these alone and just lit them as is. Thank goodness I did! Once lit, the flames burned slowly down the wicks till they reached a perfect height. Had I trimmed them, this candle wouldn’t have burned correctly. Now onto the fragrance… once the wicks were lit and the candle reached a semi-melt pool… the aroma remained pretty true. A light but sweet pink sugar, which smells like sugar and musk – heavy on the musk. With my nose at the candle and sniffing up close, I could smell the cotton candy but it was pretty subtle. Once away from the candle and just sniffing the air, it was all pink sugar. After a full week of burning this candle, I would say this candle was half cotton candy, half pink sugar. The problem is, pink sugar dominated but the strength was not very strong because of the cotton candy. This was a bust for me and I’m a little disappointed. Strength – I would rate this candle a 6 out of 10 in a really large room. 8 in a medium. 10 in a small. This wasn’t a super strong candle so the smaller the room you burn it in, the better. How did my Cotton Candy candle burn? This candle struggled to reach a full melt pool from start to finish. I tried using my wick dipper to push the leftover wax in the melt pool but the wax Colonial uses for their oval jars is pretty hard, making it tough to do. Because of that, some wax was left along the glass wall. Other than that, the wicks performed fine and the candle burned clean with no soot. Colonial’s Cotton Candy was an enjoyable scent but keeping it real, this was not cotton candy – at all. Which makes me wonder why they named it that? They should have named it Pink Sugar. 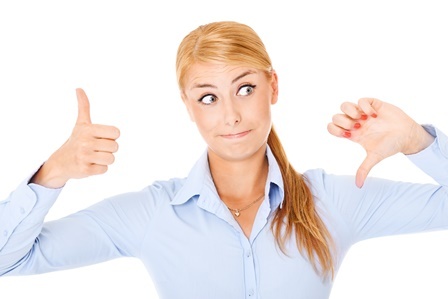 I’m still glad I tried it, I just wish the ratio’s would have been different. 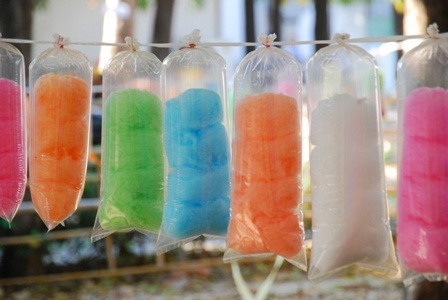 More cotton candy, less pink sugar.